In Morocco the marriage celebration includes several well organized ceremonies that can last from 3 days to a week, depending on the family and region of Morocco. These festivities are always the ideal opportunity to bring Moroccan families together and show the richness of Moroccan customs and traditions through clothing, art, music or cuisine which is represented via a cocktail of delicious dishes. Moroccan women still attend in the traditional ways. The wedding dress is usually a caftan, a sort of long robe made of silk, satin, chiffon, silk or other rich fabrics, and covered with a jacket. The dress is often open on the bottom and may have embroidery or sequined details, and may be retained by a wide belt at the waist that adds a stunning touch to the moment. The future bride and groom start formalities for the marriage about a year prior to the celebrations. Sometimes it is a simple agreement signed in the presence of witnesses and Adoul (Moroccan notary), but generally an act of formal marriage commitment is established in the presence of the family members of the couple. The husband is required to give gifts to his bride. Some gifts may be symbolic, such as sugar, which represents a happy life, or milk for purity or basic gifts which could include dates, water, orange flower and henna. They also include the engagement ring and the alliance. Gifts vary depending on the region of Morocco, and could range from jewelry and bolts of fabric, to caftans, shoes, handbags or perfume. These gifts are typically arranged in very large flat silver colored container and covered with a conical lid which is similar to the form of a big Tagine. Two days before the wedding, customs require the bride to go to traditional Moroccan Hamam, sauna with her girl friends and relatives. It is considered as an act of purification, and accompanied by beautiful traditional songs performed by her friends. The next ceremony will take place using the famous Moroccan Henna. Henna comes from a plant that can reach up to one meter in height, and its leaves produce yellow or red dyes which are often used for body paint to create different shapes and designs. At the ceremony a "Hennaya" , a professional Moroccan Henna artist, draws symbolic motifs on the hands and feet of the bride as a lucky charm for her new life. The brides friends and relatives who are involved in marriage will also get to have henna. On the day of the wedding the ceremony begins with song and dance, the tradition of Islam demands the ceremony begin by reading Koranic verses and songs in praise of the prophet. Next the guests gather in a large room. The couple follow and the bride, dressed in a white caftan with matching jewelry, heads to a large chair "the Amariya” along with her groom. 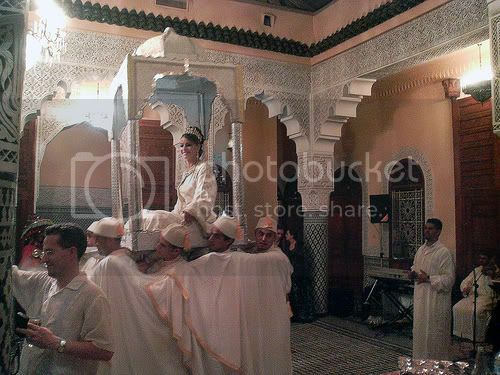 Four strong men carry the Amaria around the wedding room, so every guest gets to see and wish the couple happiness and good luck. After a few minutes of touring the large guest room, accompanied by music from a live traditional band, the couple is descended from Amariya to sit in two comfortable chairs strategically centered in the room, where wedding guests get to have their pictures taken with the couple. Throughout the ceremony, the bride changes outfits, adorning a selection superb caftons justifying the reputation of Moroccan marriages. The bride can wear as many as seven different outfits, with the last wardrobe change, in general, a magnificent white wedding dress. The bride is surrounded by "Neggafates" who are wedding master planners, since no wedding ceremony can occur without their presence. 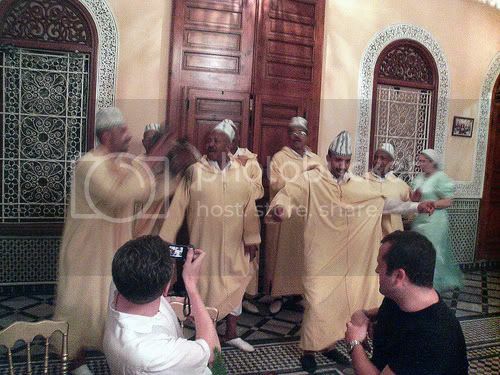 Their main task is to help with traditional Moroccan dresses, make up, jewelry, hair styling etc. Neggafates assist Moroccan couple to look their best in their wedding ceremony combining know-how about Moroccan wedding, style and fashion taste with an adequate traditional touch. Moroccan weddings are also known for the variety of exotic Moroccan dishes, unique ingredients, and dedication by Moroccan chefs to pull them together. Different Moroccan dishes are served to wedding guests including pastille (a pie in puff pastry stuffed with a fricassee of pigeon or chicken, almonds, sugar and cinnamon), Mashwi (baby lamb), Tajine (stew meat with prunes and almonds), couscous, traditional pastries and Moroccan cookies all served with traditional mint tea. The guests dance from time to time to the rhythm of music, chat and connect with other guests and relatives. The ceremony usually ends at around 5am. At the end of the wedding the couple are taken on a car parade ( a parade of guest and family cars) through the streets and neighborhoods, stopping at specific spots (local beaches or parks) to take pictures with friends before the couple head to the house of the groom. In some regions of Morocco, on arriving at her new home, the bride is welcomed by her mother-in-law who will offer her dates and milk as a sign of welcome and affection. Discover Moroccan customs and tradition in our culture section.